Love the BBC’s Fawlty Towers? Then this 5-star 2-hour immersive dining show is not to be missed. Faulty Towers The Dining Experience is produced by Interactive Theatre International (ITI), a professional theatre company founded in 1997. True to its name, ITI produces and promotes high quality interactive, site-specific and immersive comedy theatre that is performed around the world. All diners who attend the ‘Faulty Towers’ restaurant experience should be prepared for pretty much anything to happen. The fun starts right from the off, even before you are seated. Basil might utter the words “Manuel will show you to your seats – if you’re lucky”. 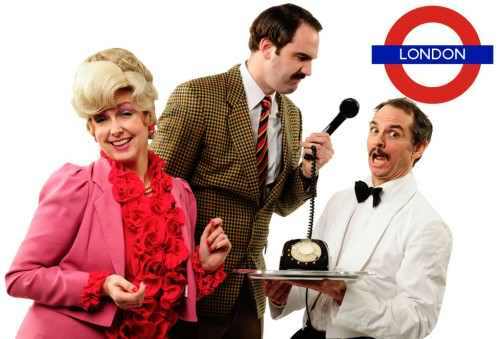 There will be gags a-plenty along with a shambolic service as Basil, Sybil and Manuel try to serve up a ‘70s-style 3-course meal along with a good dollop of mayhem. So be sure to expect the unexpected! You will surely be satisfied, just don’t let Basil know how satisfied otherwise he might say “Satisfied customer. We should have them stuffed”. Faulty Towers The Dining Experience debuted in 1997. It tours the world and is now into its fifth continuous year in London’s West End. It is a loving and hugely successful tribute to the much loved TV series ‘Fawlty Towers’, which was written by John Cleese and Connie Booth and first appeared on our screens 1975 to 1979. However, The Dining Experience uses its own original script and is 70% improvised. If you don’t know what ‘Fawlty Towers’ is then it was a British comedy television series set in a fictional hotel in the seaside town of Torquay on the English Riviera. The plots centre on the rude and hot headed Basil Fawlty (played by Cleese), his bossy wife Sybil (played by Prunella Scales), receptionist Polly (played by Booth) and a clumsy English-challenged Spanish waiter Manuel (played by Andrew Sachs), who all try hard to attempt to run the hotel amidst ridiculous situations and an array of demanding and eccentric guests and trades people. “just a little breathing, surely”. •evenings Thursday-Friday-Saturday at 7:30pm; doors open 7:00pm. •early evenings Sunday at 6:30pm; doors at 6:00pm. •lunchtimes Saturday-Sunday at 1:30pm; doors open 1pm. •Thurs dinner and Sat lunch: £75.00 (£70 concs). •Fri & Sat dinner: £79.50. •Sun lunch & dinner: £67.50 (£62.50 concs). To find out more about Interactive Theatre click here. Thanks to Interactive Theatre who let some of the community of Love Pop Ups London come down to immerse in a Faulty Towers experience. Read all blogs/reviews from the comments section below. A great experience – loads of fun and the actors have absolutely nailed the characters! The Radisson Blue hotel in London is modern and stylish, a far cry from the Faulty Towers’ hotel, but non of that matter once stepping into the world created by Torquay Suite Theatre. In the arrival room which was set up like the famous hotel lobby, I gave my coat to Manuel, and the fun started from there! The night had two aspects to it, the show which continued constantly around you, and the food which was part of the dinner. I love food, so let me start with that.